Although it's a good idea to include a variety of starchy and nonstarchy vegetables in your diet, starchy vegetables are higher in total carbs and often a better source of energy, especially for athletes, notes Iowa State University Extension and Outreach. Although eating too many carbs can contribute to weight gain and obesity, the recommended dietary allowance, or RDA, for carbs is 130 grams per day. Potatoes are excellent sources of starch and fiber. 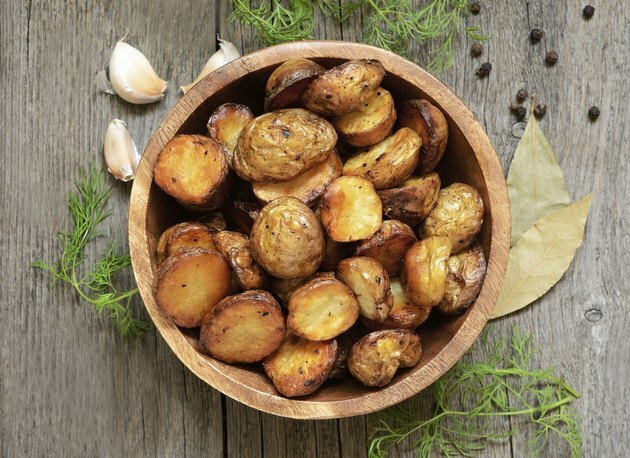 Therefore, eating potatoes -- especially with the skin on -- is one of the best ways to obtain energy and stay feeling full for long periods of time. A 1-cup portion, or 200 grams, of a baked sweet potato with the skin provides about 41 grams of total carbs, including 6.6 grams of fiber and 13 grams of sugar -- the rest of the carbs are mainly in the form of starch. A 200-gram portion of cooked red potatoes with the skin contains about 39 grams of total carbs, including 3.6 grams of fiber, 3 grams of sugar and the rest of the carbs from starch. Also classified as starchy vegetables, corn and peas are excellent sources of fiber and total carbs. A 1-cup portion of cooked sweet yellow corn contains about 31 grams of total carbs, including 3.6 grams of fiber, 6.8 grams of sugar and the majority of carbs in the form of starch. A cup of cooked green peas provides 25 grams of total carbohydrates, 8.8 grams of fiber and 9.5 grams of sugar. Similar to peas, most beans are protein- and fiber-rich in addition to being starchy vegetables. For example, 1 cup of black beans contains 41 grams of carbs, a cup of garbanzo beans provides 45 grams of carbohydrates and a 1-cup portion of pinto beans contains about 45 grams of total carbs. These starchy beans all contain 12 to 16 grams of dietary fiber and 0 to 8 grams of sugar per cup -- meaning the majority of carbs in beans are in the form of starch. Though slightly lower in carbs than potatoes, legumes, corn and peas, carrots and squash are also sources of starch. A cup of cooked butternut squash contains 22 grams of total carbohydrates, including 6.6 grams of fiber, 4 grams of sugar and about 11.5 grams of starch. One cup of cooked carrots provides about 12.8 grams of total carbs, including 4.7 grams of fiber, 5.4 grams of sugar and about 2.7 grams carbs in the form of starch. In Which Foods Are Polysaccharides Found?